The Kinloch Club is the first – and so far only – Jack Nicklaus Signature golf course to be built in New Zealand. Jack himself opened the first nine in March 2007 and the second nine opened for play in December of that year. This is not your typical Jack Nicklaus course – you can put thoughts of Muirfield Village right out of your mind. Kinloch pays homage to the great British and Irish links courses, although it is about as far from the ocean as you can get in New Zealand. The property is a piece of farmland on volcanic terrain, flanked by craggy hills and panoramic views over majestic Lake Taupo. Nicklaus has crafted a rugged, ramshackle masterpiece into this landscape, but it will surprise some visitors to learn that most of Kinloch’s features are entirely man-made. The Kinloch aura is of a raw links, somehow blended seamlessly into age-old Kiwi sheep-farming territory (shaper Jason Garten was employed to work on the finer details). However, some Nicklaus trademarks remain – greens are heavily guarded, with the premium on an incisive approach shot. And, like many others from his portfolio, it is demanding, measuring 7,363 yards (6,734m) from the tips and it has already built a reputation for being the country’s toughest track. The nation’s leading golf publication, The Cut, recently rated it that way, after surveying many pre-eminent Kiwi golfers. So far, it is alleged that nobody has yet broken 70 off the back tees and rising star Danny Lee is reputed to have not even come close to par on his inaugural three visits to Kinloch. The forward tees make life considerably easier at 6,519 yards (5,961m), but this is still no walk in the park. As for the Golden Bear himself, on playing the full 18 holes for the first time, he is reported to have quietly turned to the Kinloch Head Pro and commented that this is one of his favourite Nicklaus designs. It was a sunny, cloudy, windy day, the type you want for any time you step on the tee of a links course - and though Kinloch may not be beside the sea, it is one of the most amazing stretches of land on which you cannot help but be transported to golfing heaven. I cannot remember a time when I enjoyed every single hole so much of a new course. It wasn't overly tricked up, the rough was fair enough to find your ball, but a challenge to control from. The bunkering amongst the most artful I have ever seen and the routing of the holes clearly crafted by a golfing genius, oh yes, the one and only Jack Nicklaus! My only regret was that we didt'nt have more time as the manager offered for us to carry on for more once we had completed our round and hit the practice ground, well you just had too, that turf was such a pleasure to play off. Jack mentioned it may just be one of his favourite designs. If you don't agree, tie yourself to a giant boulder and jump into the middle of Lake Taupo for there is no pleasing you. The best course I have played in New Zealand, and that's now all except for Tara Iti!! What a difference a day makes, 24 little hours (miles…..) I allow myself to borrow a (slightly rewritten) line from Dinah Washington’s immortal classic to illustrate that yesterday I played the lovely parkland layout of Wairakei, and the day after the neighbouring moon landscaped Kinloch Golf Club. Both courses are situated less than halfanhour outside of the town of Taupo and equidistant from one another. Surrounding areas being fairly similar, the most striking difference really is the layout of the courses. And what a difference it is. Having played some 750 different courses around the world I have been searching my mind to find two neighbouring courses that present themselves as different as these two. I am talking differences in layout/design, playability and total experience . Whilst Wairakei is a natures delight that goes beyond the golf experience itself, Kinloch is pure and raw golf at its best (or worst, some would probably say). I for one was on a high for most of the round as I love links golf and also unconventional designs . To be precise; Kinloch is linksy in that it is an inland course where shapes are totally manmade, but very well so in my book. All along I had flashbacks to the Castle Course in St Andrews and to some degree to the Links Course at Fancourt, South Africa, both severely punitive courses. And this is a serious golf course. Unique, challenging, tricky, well bunkered, undulating fairways and greens, runoff areas, you name it and you will likely be spot on. Being a Jack Nicklaus Signature Course I can almost believe that Master Jack on one of his many(?) visits shall have uttered that ”this is one of my absolutely best designs anywhere”. It certainly is totally different from any of his courses that this writer has ever played. Adding to the design is the vista that greets as you arrive on the 10th tee, the highest point of the course. That is when you realize the extensiveness of Lake Taupo. It is like the world is opening up to you and the high that you are already on takes you even higher. Whilst I certainly enjoyed the neighbouring Wairakei course, I enjoyed Kinloch equally, though for different reasons as indicated above. The day I visited Kinloch (super summer day in February 2018), with my travelling partner from Australia, we were two of very few visitors that day. If that is representative for this course I donot know, but if it is I find it hard to believe that it can be a viable commercial proposition. This makes me marvel at the thought of there still being individuals out there willing to put some of their fortunes into building golf courses for the enjoyment of the likes of me. I guess they derive some pleasures out having created a monument for themselves (the driving motivation?). But I have no objections or misgivings as all the courses that I have played having been constructed on this basis have indeed been impressive and highly enjoyable, inclusive of for instance Cape Kidnappers which I got to play a few days later. The next stop on our whirlwind tour of New Zealand was a short and pleasant 3-hour drive from Cape Kidnappers. Talk about a beautiful area, bordering on the huge lake Taupo is quite the tourist destination in the middle of the country. The Kinloch Club may actually be one of Jack Nicklaus’ best efforts but it will almost certainly not be what you would expect from Nicklaus even though his work varies depending on the team he uses at the time for his design work. Kinloch is like nothing else, you first have to wonder what planet you have landed on and once you come to that conclusion here is the real kicker. The entire course is 100% man-made, every mound every bump and ripple was done by their shaper. I still struggle to accept this fact. The design and the course have the wildest fairways you will ever experience and I’m talking about comparing with courses like Prestwick and Machrihanish Dunes. If you’ve been there you would hardly believe that statement. Yet it’s true, it’s so incredibly overdone, over shaped and dramatic that I think everyone should see it. I’d heard many stories about how it’s the toughest course in NZ and many people saying it’s by far the best. Sure it’s tough but it’s playing very firm and fast and needs to be played like a links course where you carefully plot your way around and make sure to allow for ample rollout on approach shots. Be warned about firing at sucker pin placements as there are plenty of them at Kinloch. This is not a review where I would choose to go into any specific holes, the experience in itself is extremely unique and that alone warrants a visit. I can imagine reactions will hugely vary about the course and some will dismiss it as being way over the top. Make no mistake in understanding me, it’s certainly way over the top, more so than any course I can think of. Imagine the Castle Course in St. Andrews, if you have played it and think it’s on the extreme side then Kinloch will offer you a truly wild ride. I’d say it’s a must see, but I also think you should take more time than I had and play it a couple times and spend a few days in Taupo. It’s such a beautiful and quiet town in a wonderful setting, a get away from it all and truly relaxing kind of place. In terms of the course, fasten your seat belt and hang on for dear life. The Kinloch Golf Club is located in almost the geographic centre of NZ’s north island, adjacent to the northern shore of Lake Taupo, this ‘links like’ course could hardly be further from the ocean. It is the only Nicklaus design in New Zealand and opened for play in December 2007 to raves of the discerning Kiwi golfing fraternity. 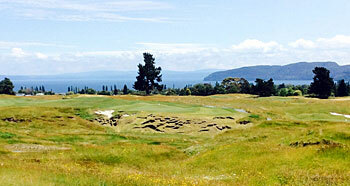 Kinloch is reliably considered the most demanding course in NZ, playing 6,800 odd metres from the tips. Gratefully, there are three sets of tees and we mere mortals have the opportunity to scarper forward to white blocks, measuring a mere 5,900 metres. The task of carving the course from this gnarled stretch of farmland is primarily the deft handiwork of shaper, Jason Garten. Virtually every design feature of the course is completely man-made and the objective of creating a links like characteristic is beautifully achieved at Kinloch. The routing meanders through a rambling, undulating valley graphically illustrated below in the par 4, 5th and akin to many of the grand British links courses, the sole flat lies you may expect are on the tees. Like the prevailing conditions at Kauri Cliffs, the weather gods failed to shine on me once more. On arrival there was a break in the drizzly rain but the wind continued to howl off the expanse of Lake Taupo offering a nippy 8 odd degrees. We were made most welcome by Tom Long, Director of Golf and Head Professional, and provided with a comprehensive resume of Kinloch and its antecedents. We residents of tropical Queensland needed a toe [ as removed from a tow ] to get started and I availed myself of the superb practice facilities as ‘warming up’ was not restricted to solely to getting a swing going. The front nine forms an interesting double loop furthest from Lake Taupo and the run home is sited on more undulating terrain to the south of the clubhouse. Full resort facilities are available at the newly opened lodge and villas from which spectacular panoramic views are to be had overlooking the course and Lake Taupo. On playability, particularly in the conditions encountered, this course is the consummate challenge to the low marker and even from the forward tees, an extremely difficult proposition for the high or middle handicap player. A personal observation only, but I consider it bordering on ‘too hard’ for the average middle or high handicap duffer. Indicative of such is the fact that the course plays very long from the tee and I lost count at around 50, the number of bunkers in just the first five holes. And, just to compound the ‘difficulty’, many of the vast green complexes comprised literally ‘roller coaster’ undulations. I have little hesitation in saying that this is possibly the toughest course I have yet encountered. Most holes offer a variety of options from the tee. The risk and reward factor, ever present and tempting. But beware; in the majority of cases, an errant shot is most severely punished. It is a ‘thinking’ player’s course and never a bad fairway lie encountered, if usually requiring play from an uneven stance. The Kinloch design/routing, appears to have an in-built resistance to scoring, more so than most. Opting for the right line from the tee is an absolute priority as is negotiating the consistently uneven lies and fairway bunkering. When you get ‘the flat bat’ in your hand, you will find the green complexes generally huge and offering a frightening variety of undulations. To my dismay, I found that in two instances, a missed, relatively short putt from above the hole, finished up twenty metres past the cup, and, twenty plus metres off the green. But, reading the breaks and borrows on these outstanding green complexes provides a degree of fun. Take your ‘A’ game with you as this is one beaut, testing track. Notwithstanding being the consummate test of all aspects of your game, a round at Kinloch is a most memorable experience. This is a course well deserved of its prominent position in the upper echelon of New Zealand courses. Now that I have played it at possibly its toughest, Kinloch is a track I would relish revisiting in more benign conditions. Tip – to ensure a pleasurable round, don’t ‘beat yourself up’ and seriously consider the forward tees. The following is an interesting quote from an astute reviewer; “Even for ‘A’ graders, there can be cases of people’s egos writing cheques their bodies can’t cash” I suggest that this fellow is right on the money. PS – Again, take an adequate supply of ‘ammo’ as here, the fescue grasses bordering the fairways are well nourished with errant pills. The Kinloch Club course is, in my experience, one of the best Nicklaus courses. Whilst it remains over bunkered and the greens are at times to severe it is a very pleasing course visually with most holes filling the "memorable" category. The bunkering also has a bit of the waste area look and that adds to the visual elements. Nonetheless, this is a difficult track - probably too severe for most handicap golfers without a single digit handicap. In addition, this is not a course set up for lady golfers. Nicklaus seems to think that putting a tee a bit or a lot closer to the hole is enough but it creates unfair teeing areas with too many blind shots or shots towards bunkers that don't come into play for men. This is a good course in excellent condition but it could have been great. It certainly is potentially a far better course than either Kauri Cliffs or Cape Kidnappers. bit harsh I feel, for a course that entered the top 100 list here shortly after opening. yes it is hard but I actually scored significantly lower here than at cape kidnappers and thoroughly enjoyed the course. I believe choosing the correct tees is important. even for 'a' grade players there can be cases of people's egos writing cheques their bodies can't cash.. I stumbled across this course nearly two years ago during a non-golfing trip and thought it looked like a quality layout. Now It is ranked in the top 100, and with my passion to bag as many of the top courses as I can it was an opportunity not to be missed with a week off work. I agree totally with the previous comments. Walking around at half 7 before anyone arrived I could see the place is manicured to perfection, it was as if I had woken up in Tiger Woods PGA 2011 with the carpet like fairways and great definition between fairway/semi and rough. The Practice facilities are top notch and you know you have arrived at a very fine track. The course is without doubt one of the toughest I have played off the backs. The fairways are a decent size but certainly not as generous as many other of the top modern courses I’ve played. The bunkers are expertly positioned and stray off the short stuff at your peril as it’s a guaranteed scrubby lie and a difficult recovery. In addition the length demands a lot of long 2nd shots to greens that are often narrow, undulating, angulated and protected by yet more sand! Its easy to see why nobody has broken 70 here. There are many world class holes on the opening stretch, in fact I would say the par 3 7th is the only hole that prevents a clean sweep. My personal favourites are 5 and 6 that are two of the best par 4s around. The back 9 is also excellent, though for some reason didn’t grab me quite as much as the front. Possibly because of the proximity of houses at the far end reminded me that I wasn’t all alone in the wilderness. In addition I felt that the final two par 3s although top quality holes just looked a bit similar. I'm picking hairs here but when trying to rank my favourite courses in the world that’s what I have to do. The other thing is that this place is a bit of a trek if you like carrying your clubs around. By the end of my first round I was almost as knackered as I was coming down from the tongariro crossing the next day! The buggy made a huge difference on my second round. Finally, the pro was excellent and very willing to help, even delivering a bacon sandwich and coffee to me on the 5th hole! Overall this is a fantastic course that must be played if you are golfing in NZ. Of the courses I’ve played in the southern hemisphere I would place it 2nd behind Barnbougle Dunes.